I am a bit on the roasted beets kick these days. I just shared how I used them in a salad, this post is all about a hummus I put together, and, believe it or not, I have a pile of roasted beets in the fridge that are waiting for me to figure out what to do with them. The batch in the fridge was roasted in the oven, and that method – cranking the heat to 425 F (220 C) and roasting them for about 30 to 45 minutes – will work here as well. But the beets that I used for this hummus were roasted on a grill. I recommend you try this next time you grill your veggies, tofu or try my Portobello Mushroom Steaks. Your grill will already be on so it’s perfect time to wrap your bits in some foil and toss them on! The rest of this hummus recipe is super easy. You will need a large mixing bowl, two cans of chickpeas, rinsed and pat dried, some lemon juice, and a spoonful or two of almond butter, and all the lovely roasted beets, cooled and peeled. You will also need a hand-held, stick blender, and let it rip until everything is well blended and smooth. You can always use a good processor if you have one or a powerful blender. I have neither so hand-held, stick blender is my tool of choice. What you’ll end up with is a nice pile of lovely and bright magenta hummus that will keep well in a plastic container with a tight lid for a week in the refrigerator. Roast the beets, let them cool and peel. You can roast them in the oven or on the grill. Either way I recommend wrapping them in foil. This will minimize the mess and speed up the roasting. Regardless of where you roast them, it will take about 30 to 45 minutes to get the beets roasted all the way through. Please note that you can eat beets raw, so you can actually skip the roasting all together. Roasting does help bring the natural sweetness of beets out more, so in my opinion it’s worth an effort. Cut the roasted beets into cubes, and place into a food processor or the large mixing bowl. Place the chickpeas into a strainer, rinse them well and pat dry. Add chickpeas to the bits, add the rest of the ingredients and blend until smooth. Serve any way you like. For me hummus is one of the best sandwich spreads ever, and this one works like a dream when paired with avocados!!! Salads can be simple, but as I was putting together my first ever plant-based – vegan – Easter dinner this year I decided that going for impressive, fabulous and a bit over the top, even when it comes to a salad, wouldn’t hurt. Maybe you’ve already seen, or even tasted, my Meatless Shepherd’s Pie – if you haven’t now would be a good time to do it – and this salad is what I paired it with. The base of the salad is baby kale which you can probably get these days in any well-stocked supermarket. If you can’t find baby kale go with mixed field greens or baby lettuce, or just chop up some romain or butter lettuce. Stay away from baby spinach and iceberg lettuce as I am not convinced those two will play nice with roasted beets and roasted leeks. 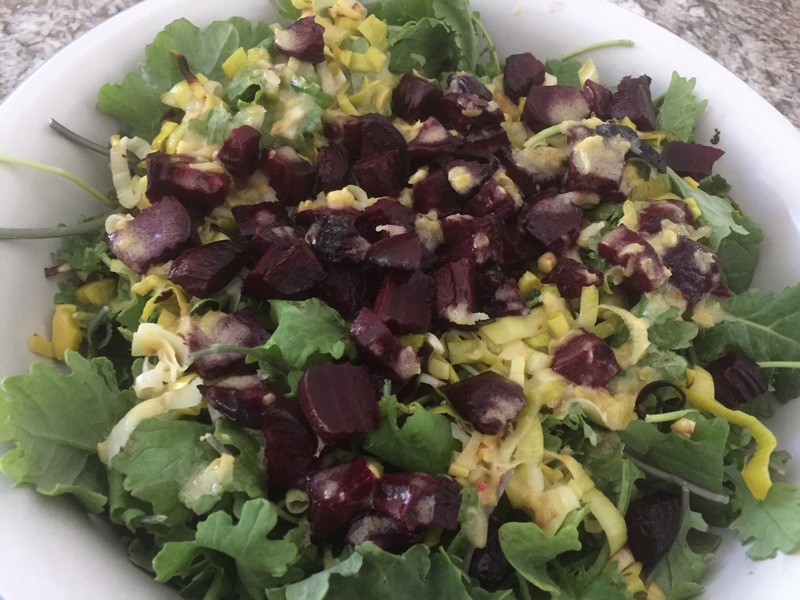 What makes preparing this salad a bit more elaborate than your tossed salad is the fact that both leeks and beets need to be cleaned, chopped, roasted and cooled before hitting the salad bowl. I’ve already shared how to clean leeks, so I used the same cleaning method on this occasion as well. 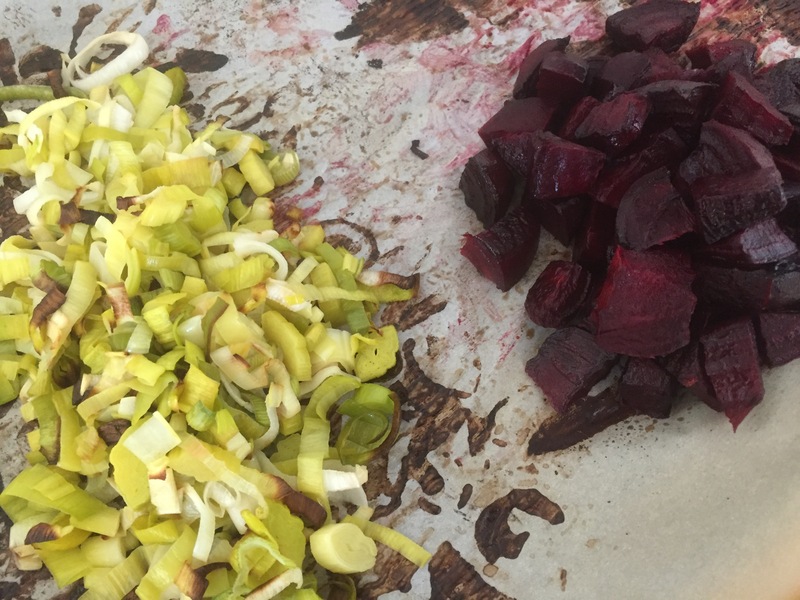 For this recipe I recommend cleaning and chopping the beets before roasting to maximize the amount of beer surface that is nicely caramelized. You may want to wear gloves when you handle beets as they will stain your hands. I personally don’t mind it at all but if you do please plan to protect your hands an wear the gloves. Preheat the oven to 425 F (220 C). Clean the leeks to remove all the sand and dirt that leeks usually come with. Dry well and place on the parchment paper lined baking sheet. Spray with a generous amount of cooking spray. Peel the beets and cut them to 1 in (2.5 cm) cubes. Place on the parchment paper lined baking sheet and spray with cooking spray. Roast for 20 to 25 minutes. Take out of the oven and let cool for several hours. You want the roasted vegetables to be at room temperature for this one! To make the lemon vinaigrette, mix together juice and zest of one lemon, with the olive oil and Dijon mustard. Place baby kale in a large salad bowl. Top with roasted beets and leeks, and drizzle the vinaigrette all over the salad. Toss everything together and serve!! !